What are colony forming units? Colony forming units, usually abbreviated as CFU, refer to individual colonies of bacteria, yeast or mold. A colony of bacteria or yeast refers to a mass of individual cells of same organism, growing together. 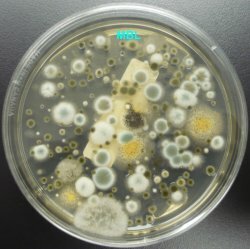 For moulds, a colony is a group of hyphae (filaments) of the same mould growing together. Colony forming units are used as a measure of the number of microorganisms present in or on surface of a sample. Colony forming units may be reported as CFU per unit weight, CFU per unit area, or CFU per unit volume depending on the type of sample tested. To determine the number of colony forming units, a sample is prepared and spread or poured uniformly on a surface of an agar plate and then incubated at some suitable temperature for a number of days. The colonies that form are counted. CFU is not a measure for individual cells or spores as a colony may be formed from a single or a mass of cells or spores.